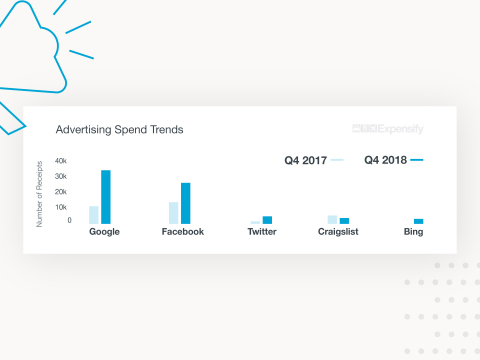 Spend Trends examines company spending behaviors and provides insight into today’s most popular, fastest-growing, and up-and-coming business expense trends. 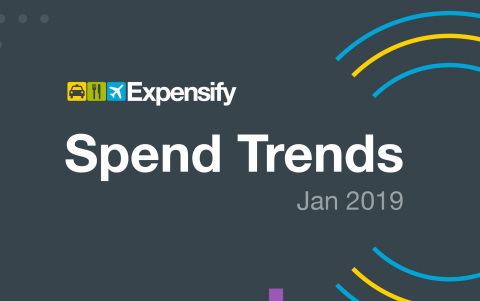 SAN FRANCISCO--(BUSINESS WIRE)--Expensify published its Spend Trends analysis today to explore how business expense trends are shifting over time. The report shares insights on topics ranging from the most popular business expenses such as rideshare apps, to lesser-known spending patterns in advertising, software, printing, bikeshares, and food delivery. 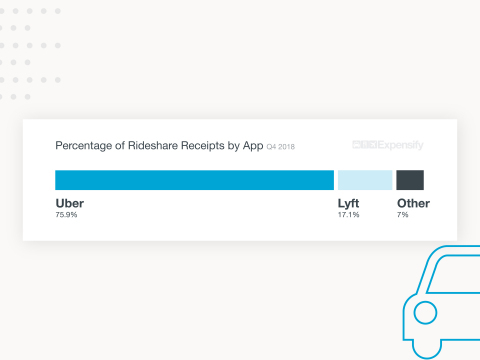 The analysis begins with the most popular business expenses – rideshares – which Uber and Lyft continue to dominate. Combined, the US-based archrivals account for 93% of all expensed business rides, though riders choose Uber nearly five times more often than Lyft. In Southeast Asia, Grab showed more than 200% growth over the last year, earning its place as the third most frequently expensed rideshare service. The four fastest-growing business expense categories are advertising, software, printing, and scooters and bikeshares. Advertising takes first place with an average growth rate of more than 250% across the three most popular platforms: Google, Facebook, and Twitter. 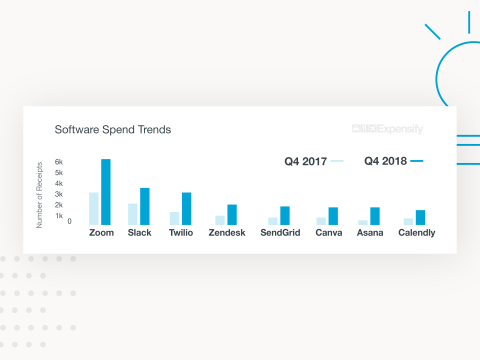 Companies also continue to invest heavily in software – receipts for workflow technologies such as Twilio, Asana, Slack, Zoom, and SendGrid grew by an average of more than 180% over the past year. 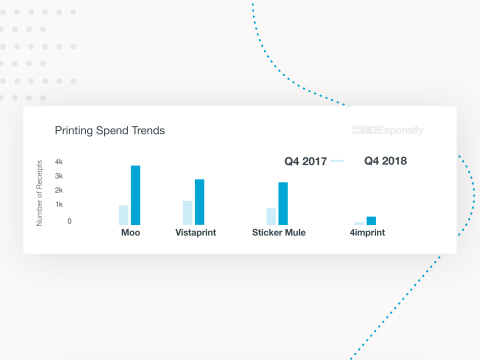 Business spending on print materials has also increased, with business card giants Moo and Vistaprint growing 344% and 90% over the past year, respectively. 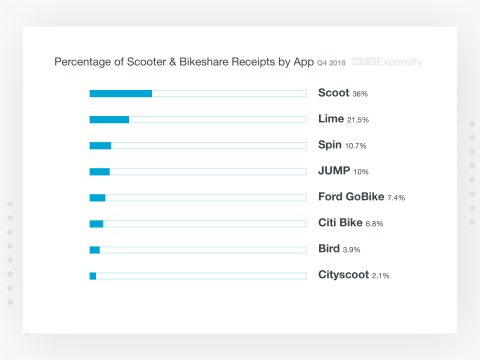 The fourth expense trend hints at the evolving employee commute, where scooter and bikeshare services Scoot and Lime win the race against other two-wheeled transit apps. To round out the analysis with an up-and-coming category, Spend Trends focuses on meal and grocery delivery. 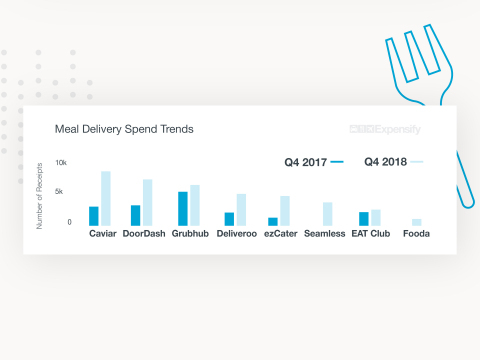 Business spending on meal delivery services such as Caviar, DoorDash, Grubhub, and Deliveroo surged an average of 150% over the past year. 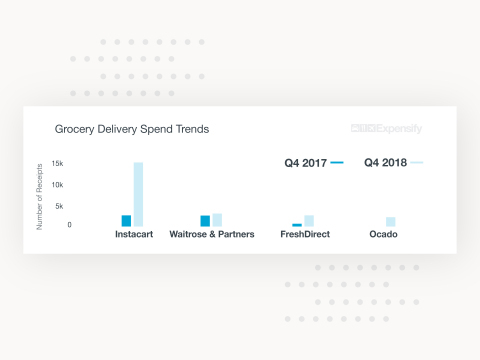 Dominated by Instacart’s 450% growth, grocery delivery also increased significantly in 2018. Expensify is the only receipt tracking and expense management app built for everyone – from the self-employed to Fortune 500 companies. The easy-to-use tool automates your entire workflow with SmartScan OCR receipt scanning technology, company card management, next-day reimbursement, and other time-saving features. Expensify is the only expense management partner of the AICPA and used by more companies than any other expense software in the world. Join the millions of people already saving time with Expensify at use.expensify.com!